Krishna works as an Internet Saathi in Basai Nawab, near Dholpur, teaching other villagers how to use the Internet. She agreed to have her picture taken along with her shop, which she set up with her earnings as an Internet Saathi. DHOLPUR, Rajasthan — After Drake's "Kiki Challenge" went viral around the world, a video of two villagers in Telangana racked up millions of views on YouTube and Facebook. The clip, which showed two farmers grooving to the Canadian rapper's hit song even as their oxen ploughed a paddy field, epitomises how far Internet culture has penetrated Indian society, just not in the way most people sharing the video assume. The video was staged by Sriram Srikanth, a young electrical engineer who runs a YouTube channel called My Village Show; one of the dancers is an aspiring actor. The Internet is coming to rural India, but at this point it is more top-down than bottom-up, more astro-turf than grassroots. And who's behind this rural push? The same giant technology companies who want to collect information on the millions of Indians who are still offline. HuffPost India met with villagers living near Dholpur, a small town in Rajasthan, where Tata Trustsand Google India have been running a project called 'Internet Saathi' to train rural Indians to use a smartphone to access the Internet. The project, launched in 2015, is active in 17 states and has already reached 150,000 villages, and has close to 50,000 Internet Saathis, or 'Internet guides' on board. The lessons are basic, but for people who have never used WhatsApp or YouTube before, the results can be revolutionary—users get to experience the Internet with all its thrills and horrors, while companies like Google get to learn about a population that still mostly lives offline. The trade-off between privacy and user convenience, which underpins the modern Internet, is slowly taking root in India's villages. "Internet Saathi was conceived and launched as a pilot in 2015 to bridge the divide between rural and urban Internet users, to give people access to learning, financial savings and government schemes through Internet literacy," said Raman Kalyanakrishnan, head of strategy and innovations, Tata Trusts. "We started with 5,000 villages in 2015, in partnership with Google, and aim to reach 300,000 by the end of 2019." According to a report released earlier this year, Internet penetration in urban India was almost 65 percent as of December 2017, while that of rural India was just 20 percent. The project's goal, said Kalyanakrishnan, "was to help women leverage digital skills and use those to earn money in different ways." The project also collects data for use by local governments and philanthropic organisations, he explained. For Krishna, a woman in her twenties, the Internet Saathi programme in Dholpur is a second chance at life after she escaped an abusive marriage three years ago. When she decided to return to live with her parents after a trip to the hospital, Krishna discovered that finding employment was not an easy task. Then she heard that an NGOwas teaching women how to use the Internet, and paying them to teach others. "So I went to them, and that is how I became an Internet Saathi. The job got me out of the house, and at first, people weren't supportive," she said in Hindi. "They did not like that I wasn't living with my husband, or that I was going about on my own. But I stuck with it because I needed the money." The women HuffPost India spoke to did not want to provide their last names. Ganga, a woman in her seventies in Krishna's village, knew she was eligible for a pension but did not know how to access it. Krishna helped Ganga and her husband apply for the scheme online, and guided them through the process until they began receiving the benefits. Ganga's husband died two years ago, but she still continues to receive her pension, thanks to Krishna's help. Google and Tata Trusts give saathis like Krishna a basic smartphone and a SIM card with a paid-for data connection. They are paid between Rs 4 and Rs 8 for every woman they train to use Google's Android operating system, search Google for information, and to find educational videos on YouTube. It is a Google-centred universe, sometimes shared with rivals such as Facebook's WhatsApp. For instance, the saathis have a WhatsApp group that they use for co-ordination; and many of them also have smaller private groups for talking to each other informally. 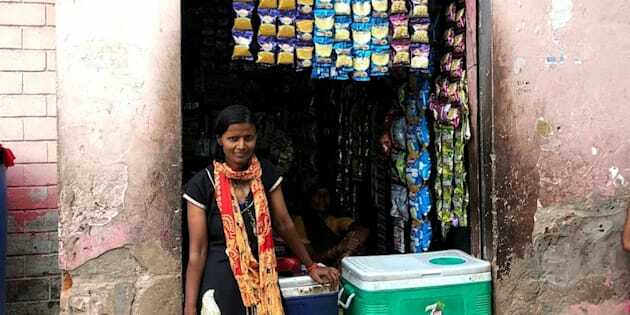 For Krishna, participating in the programme offered her enough money to start a kirana store—a tiny kiosk selling chips, soft drinks and daily provisions—named Saheli (Friend). "Now I have my job (as a saathi) and my shop," Krishna said, proudly. "I am raising my children by myself, and now everyone knows me as the 'Internet lady'." For others, the programme has been beneficial in different ways. For Gita, an outspoken 17-year-old, becoming an Internet Saathi meant she had a phone with a data connection in a place where only 3 in 10 women have access to the Internet (Tata Trusts' Kalyanakrishnan says this number was just 1 in 10 women in rural India in 2015). This proved to be crucial when her father was admitted to the hospital. "I couldn't attend class anymore, I had to look after my father," Gita said. "But I was able to find my lessons on the Internet and study while I was waiting in the hospital, and give my exams. I even helped my brother to study, and paid for part of his education with the money I earned." The phone also opened up avenues for entertainment. "If you're a woman, you can't go and watch movies. You can't go by yourself, and even in the family, your brothers or husband will go, but you're not welcome," said Gita. "With the phone, we learned how to download movies, and now my friends and I can watch them at home where no one will stop us." Most rural households typically have only one phone, which remains with the men in the family. By putting phones in the hands of women, the Internet Saathi programme is slowly altering gender dynamics. "The goal was always to get more women online to benefit rural India. There were a number of barriers, including access, knowledge and mindset. Women couldn't even go far from their homes, it was seen as bad for women," said Neha Barjatya, who heads the Internet Saathi programme for Google. "This is something that we have been able to change by giving handsets and training the women, while the importance of the Internet is also something that people have been recognising for themselves." In her book Dragnet Nation, journalist Julia Angwin writes of how Silicon Valley's quest for increasingly detailed and granular datasets has become an end in itself. "Dragnets that scoop up information indiscriminately about everyone in their path used to be rare," writes Angwin. "That's no longer the case, as these dragnets are extending into ever more private corners of the world." In India, we've seen this play out with Facebook's internet.org—this was later renamed Free Basics, before the programme was pulled from the country. Free Basics, which offered free Internet, was particularly aimed at villages and semi-urban areas, but offered a tightly controlled and Facebook-led experience. So much so that in parts of the developing world, such as Indonesia and some African countries, Facebook was considered the entire Internet. The Internet Saathi programme is a little different, since it wants to teach people how to use Google to find things on the open Internet, but concerns remain. 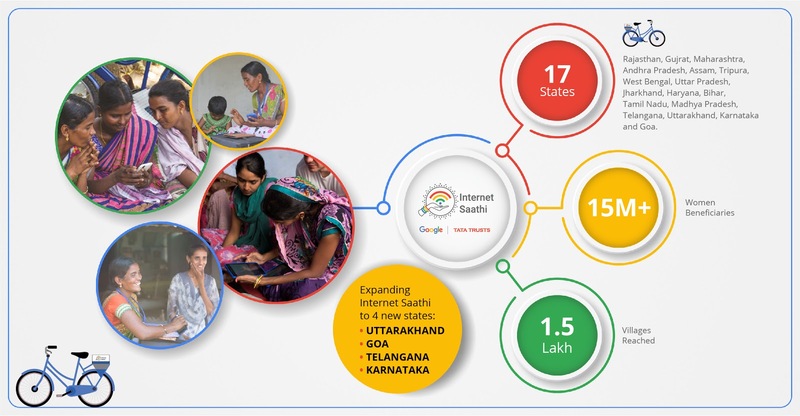 Google and Tata Trusts have launched a number of initiatives for the saathis to earn money. One such initiative is data collection—the saathis are familiar with the area, and act as survey agents for a number of different organisations, with the goal of "driving impact", Kalyanakrishnanexplained. "Technological transformation in India cannot happen without the active participation of private players and trusts, like Tata Trusts, Internet Saathi by Google," NITI Aayog CEO Amitabh Kant said at an event last year. In May this year, the saathis around Dholpur carried out a survey for the NITI Aayog on household consumption, age, health and incomes of family members, and the details of the house itself, among other things. The survey included photos clicked on the phones provided to the saathis. The challenge is convincing other villagers to take part, but the saathis are a strong local presence, and usually don't face much trouble. "People will ask, why do you want to know this? What will I get if I fill out the form? Is the government giving us new houses? Things like that," says Mamata, who has been a saathi since 2015. "Some women don't want us to take their photo, and if men were to try and do this, no photos would get taken. Other people say, don't take a photo of my house, take a photo of my hut in the farm. In case they are going to give something, I will look more deserving." The saathis also carried out a household survey for Google Kantar on the goods being consumed by households. Kantar, a survey organisation that has been partnering Google since 2009, carries out on-the-ground studies as a "measurement partner". This data is used to measure the impact of the work that Google is doing in the villages, the company explained. "Can you imagine men coming to do this? They would talk to the men of the house, who wouldn't know anything," laughed Krishna. "We talk to the women, so we can tell you what brand of atta (people use), what amount of oil is being used in the kitchen, how much soap people are using, all that." This information is meant to guide interventions in the villages by NGOs and the government, said Google's Barjatya. The saathis, she added, are told to seek the villagers' consent before asking questions, and given special training for this. "Privacy is obviously a priority, and data is aggregated at the district level. There is training given to the saathis on how to explain what they're collecting information for, and we don't keep any personally identifiable information at all," said Barjatya. "The idea of using the saathis for the Kantar survey in villages was to have them go over the different metrics to develop a profile of the villages on agriculture, health, and microfinance," she added. "What we found is that the error rate is much lower than what you see with field agents." Thus, a region that was once terra incognita for Google is rapidly being measured, assessed and added to the data silos. But the women in Dholpur aren't complaining. "We still have to do the housework, some people will still pass comments about us for going out of the house to work. Things have not changed so much," said Mamata. "But I am earning money, I am earning respect, and people listen to me now. Give me more forms to fill out, I am happy."